Kitchen refacing is an affordable and effective way to brighten your kitchen and make it look wonderful for everyone to see. There’s no doubt that the cabinets in your kitchen are an attention-grabber. They collaborate to form a focal point for the eye and are crucial to your kitchen’s functionality. The good news is, those old kitchen cabinets can easily become bright and vibrant once again with the help of Vianvi Signature® Cabinet Refacing from Reborn Cabinets. You can choose from thousands of different combinations of wood species, stain, glaze, and hardware options for a look that fits your home to a tee. They look just like brand new cabinets, but are available at only a fraction of the cost. We manufacture and treat all kitchen refacing components in our own facility, keeping harmful chemicals and fumes away from your home and family. We can transform your kitchen in as little as three days. Everything is backed by a 25-year warranty. 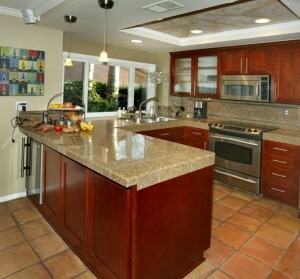 Though our name is Reborn Cabinets, our kitchen refacing services far exceed just cabinets. In fact, we are a full-service kitchen and bathroom remodeling contractor, licensed, bonded, and insured for work in the state of California. We can give you a complete kitchen remodel, consisting of granite countertops, a new backsplash, new flooring, and so much more. We will help you achieve your desired kitchen design, transform your kitchen into the kitchen of your dreams, and provide you with The Ultimate Remodeling Experience®. For additional information about the kitchen refacing services from Reborn Cabinets, please call us at 1-877-371-4943 or stop by our 40,000-square-foot showroom and manufacturing facility in Anaheim. We are proud to serve customers in Los Angeles, Yorba Linda, Santa Ana, Placentia, Orange County, Mission Viejo, Laguna Niguel, Huntington Beach, Fountain Valley, Brea, and surrounding communities throughout Southern California. "Thank you for your AWESOME job as our installer with Reborn Cabinets."